We were definitely impressed by our first sighting of these superb flower dangles on the Fuchsia plants at the Cactus Valley in Brinchang, Cameron Highlands, home to many of Malaysia’s spectacular flower gems rarely seen elsewhere, especially in the lowlands. Numerous trusses of beautiful and vibrantly coloured blooms were seen hanging pendulously over some large and luxuriant shrubs. Fuchsia shrubs of various cultivars were crowded together, parading the eye-catching beauty of the their kaleidoscopic floral colours in a dramatic and romantic fashion! A captivating sight to behold! Observing the exotic flowers more closely, they do resemble ballerinas as many have suggested… the stamens and style look like the ballerina’s legs while the sepals and corolla resembling the dancer’s multi-coloured tutu! Fuchsias are easy to grow perennial shrubs and reward generously with almost year round blooming, making them popularly sought after by gardeners and landscapers alike. Etymology: Fuchsia (often misspelled as Fuschia) is derived from the German word, ‘fook-sya’. The first discovery in 1703 was Fuchsia triphylla by the French missionary and botanist, Fr. Charles Plumier, who named the genus after the renowned German botanist, Leonhart Fuchs. Origin: Majority of Fuchsia species are native to Central and South America, 2 species from Hispaniola, 3 in New Zealand and 1 on Tahiti. Species are mostly tropical or subtropical except Fuchsia magellanica, the only temperate species discovered at the southern tip of South America. Fuchsia hybrids, on the other hand, are popularly hybridized and cultivated worldwide. Plant type: Mostly perennial flowering shrubs, though some are trailers and one exception is the only New Zealand species, Fuchsia excorticata that grows as a tree, reaching between 12-15 m in height. Features: The genus Fuchsia consists of about 120 wild species, with cultivated hybrids and varieties numbering into more than 10,000. With such an extensive number, it is inevitable that Fuchsias is extremely diversified in habitat, growth habit, appearance and the like. They are seen in all kind of shapes, forms and colours! Fuchsias are mostly perennial ornamental plants suited for the tropical and subtropical regions though many newer hybrids have been discovered to be winter hardy for temperate regions too. Most Fuchsias have upright bushy habit, some grow vigorously while others may be slow to moderate-growing. They’re featured either as low-growing compact shrubs from 0.2 m to medium-height shrubs up to 2 m, or taller as huge shrubs, tree-like, up to 4 m in height. These can also be structured as standards in the garden or for pot culture. Some Fuchsias are trailers instead and often called Basket fuchsias. In fact, quite a large number of the Fuchsia hybrids/cultivars and their varieties currently available are the trailing type. They have long, lax and free-branching stems with overflowing dangling blossoms which are suitable for hanging baskets and pots, where the full glory and beauty of their flowers can be truly admired. They can also be ground-grown as lax bushes with proper supports. Depending upon the species and cultivars and in which region they’re grown, Fuchsias may be either evergreen, semi-deciduous or deciduous and tender annuals or hardy perennials. Typically, the multi-stemmed Fuchsias produce green leaves that may be either simple or with serrated margins, oval to lanceolate-shaped, and are opposite or in whorls of 3-5. Fuchsias most captivating feature are their stunning and colourful flowers that are long-lasting and borne prolifically year round in the tropics and all summer to late fall in cooler regions. Pendulous flowers dangle on thin pedicel that emerge from the leaf axils, each with 4 long and slender sepals that droop or may recurve upwards to expose the corolla, consisting of many petals and from which the stamens and stigma protrude. Sepals and corolla may either be of the same colour or contrasting. Besides resembling ballerinas, Fuchsias are often nicknamed ‘Lady’s Eardrops’ as their hanging flowers look like large earrings. Depending on the species or cultivars, flowers may be single, semi-double or double and come in various shapes and forms – small to large, short to long, narrow to full. They come in an array of psychedelic colours in every shade except true blue, and many in an explosion of stunning colour combinations of purple, red, magenta, pink, white, etc. with sepals and corollas in striking contrast, appearing charmingly flirtatious. Their magnificent flower dangles are magnets for hummingbirds and other nectar-feeding insects. Fuchsias bears small edible berries containing very small seeds that may be viable for propagation. Culture (Care): Since wild Fuchsia species are rarely cultivated and hybrids are almost countless with extremely variable characteristics, hence the following culture provided below serves only as general guidelines. 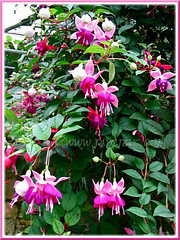 Nevertheless, Fuchsias on the whole are easy-to-grow and easy-to-care plants. If properly cared, it will live for many years to brighten your garden with long flowering season. Light: Grows best with morning sun and shade in the afternoon, as well as need plenty of fresh air. It grows well in dappled sunlight too. A light and cool location, shielded from the blazing sunshine and strong winds, is most ideal. Most Fuchsias love cool conditions and dislike too much heat but there are some that are heat tolerant to different degrees. Moisture: Water moderately and regularly, keeping it evenly moist but never water-logged nor dried out. More water during hot seasons and less in cooler clime. It enjoys high humid environment. Soil: Rich fertile soil with a mix of sand and should be well-drained and well aerated. Not advisable to use clayey soil that are too compact. If necessary, line the bottom of the pot with thick layer of very coarse sand, some pebbles or crocks to improve drainage. Others: Feed once weekly with a general liquid fertilizer with a balanced N.P.K. Pruning is essential after flowering or towards the end of the growing season to encourage bushiness and branching which will result in an increased show of flowers as Fuchsias develop flowers on new growth. It is also to maintain desired height/size and tidiness, keeping it aesthetically appealing. Dead-heading is encouraged to improve flower production. Shrub Fuchsias can be trained as standards. Relatively free from serious pests and diseases. Watch out though for whitefly, red spider mite, aphids, thrips and caterpillars that may attack fuchsia plants and treat them early. 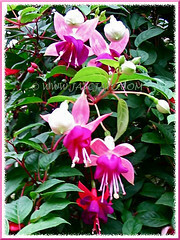 Check further on how to grow and care for fuchsias by Heyne’s Garden Centre, South Australia. For subtropical & temperate regions: Hardiness: USDA Zone 5-8 for Fuchsia magellanica and its varieties, Zone 7-9 for winter hardy Fuchsia species/cultivars as listed by Northwest Fuchsia Society and Zone 9 for the many other Fuchsia hybrids. Easier to grow the kind of fuchsias that can survive outdoors in your location year round, otherwise you’ll need to overwinter your tender plants indoors to be protected from frosts and freezes, and move plant outdoors in spring. Learn about winter care by Gardening Know How and BellaOnline. Learn too the correct pruning technique when overwintering fuchsias by Dave Clark, the renowned Fuchsia Specialist and Hybridist who had won many Best in Show awards at B.F.S. and other National Shows. Propagation: For cultivars, best to propagate from healthy tip cuttings (softwood or semi-hard cuttings are viable too), as they do not come true from seed (different variety emerge. Cuttings root easily in potting medium or in a glass of water. Using a sharp knife, trim the growing tip just below the leaf node of the fifth pair of leaves and remove the 2 pair of basal leaves. Next, use your little finger to make a hole in the moist potting soil deep enough to accommodate the cutting with the lowest two pair of leaf nodes inserted into the medium. Then lightly firm the soil around it to hold in place. Site the pot in a cool and bright spot away from direct sunlight. Water normally (do not overwater) or with regular misting, the cutting should root within 2 weeks. Dave Clark’s in-depth and well-illustrated article on propagating fuchsias with cuttings is a must read! Fuchsias can also be propagated by ground layering – just pin a section of the stem to the ground and cover it with some soil. When it root easily within a few weeks, just severe it from the parent plant and grow as a new plant. Some fuchsias even produce aerial roots in a very humid environment, hence air-layering themselves. 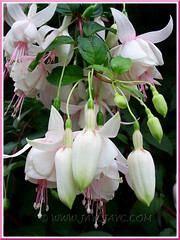 Usage: Fuchsias make excellent ornamental specimens or standard plants in the garden. Or simply grow it as a colourful bush in a mixed border or use hardy Fuchsia cultivars/varieties of different colours to create an appealing flowering hedge. Ideal too as container plants for indoors or outdoors as perennial shrubs at the porch, patio or deck to splash their gorgeous colours. Cultivars with scrambling branches can be trained to cover trellises, arbors and arches. To enjoy the splendid beauty of the pendulous flowers, the trailing Fuchsia varieties will be most attractive in hanging baskets or pots. 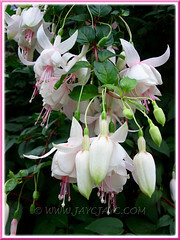 Moreover, you can give Fuchsia plants as lovely gifts for any occasion. Dave Clark’s Fuchsias, with illustrated growing techniques. A must explore for fuchsia enthusiasts! 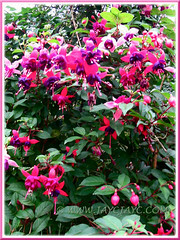 More Fuchsia plant pictures – Enjoy! for his generous help in identifying the 3 fuchsia cultivars below. P/S: So happy to have finally completed this fuchsia article. Though it took more than a week to gather info and compile them here, it has been so worthwhile because I got to enjoy and be mesmerized by the countless fabulous fuchsia photos discovered online and learned so much in the process. Hehe, this was one of the reasons why it took me so long to produce this post… I got sidetracked! Happy too that I can always return here to easily link me to them again whenever I lust for these amazing beauties! I really wished I could grow fushia in my garden. Its a pity that they are highland climate flowers. Have you manage to see or find any which are really hardy that can take a lowland hot climate fushia? Your wish is our ardent wish too! I’m always excited to discover more about fuchsias so thank you for such a fascinating report from Malaysia. Fuchsias don’t take well to constant heat and humidity so I’m not surprised that they won’t grow in your low-lying areas, but it’s exciting to discover yet another area right next door to you where fuchsias have found an amenable home. I’m wondering if you might be able to shed any local light on how and when these fuchsias found their way into the Cameron Highlands and if you’re aware of the particular cultivars that are growing there? Our pleasure in sharing. Thanks for further insight on fuchsias culture. Sorry, we’ve no idea at all re their earliest arrival to C.Highlands. However, the 3 named cultivars as pictured above are amongst the few seen growing there.